Open Streets has been a favorite Near Southside community event for nearly a decade. 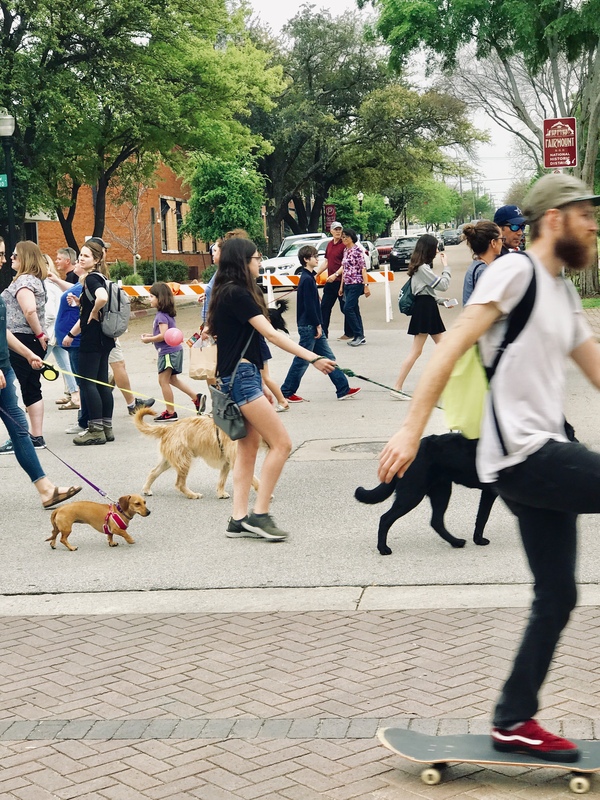 And our dog walkers in Fort Worth were there to tell you all about it! Once a year, between 12-4 pm, Magnolia Avenue in Fort Worth, Texas closes off traffic. 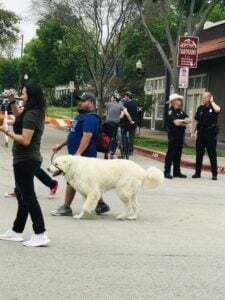 And it gets temporarily taken over by cyclists, skaters, food trucks, face painters, outdoor yoga, and best of all, dog walkers! This year seemed particularly busy. 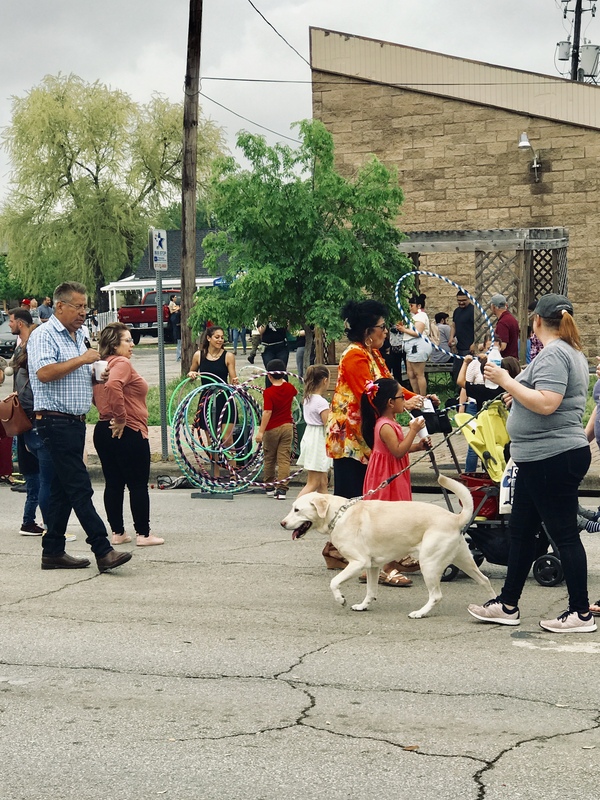 Hundreds of people of all ages (from stroller to cane) were shopping, sampling new vendors, rollerblading, biking, snacking, taking pictures, laughing with friends. 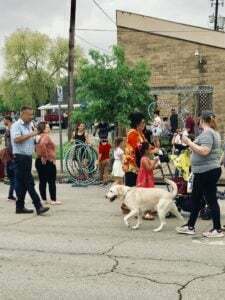 Four-legged people were there in droves, as well… You could find all kinds of pets from tiny poodles in pink sweaters to Rottweilers with studded collars, and everything in between! Musicians dotted the block, strumming guitars, playing drums. A pet adoption booth was present. It provided opportunities for event participants to leave with their own forever furbaby. Children ran around with their faces painted as butterflies and ladybugs. A hula hoop vendor offered giant striped hoops. It was one of the most fun exercises around! There was truly something for everyone! The public art displays and artisanal crafts were irresistible. One could feel the overall infectious spirit and vibe of the crowd. The rock stars of the event were the skaters. 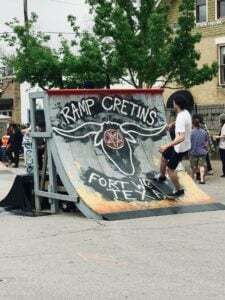 “Ramp Cretins,” as advertised on the steep ramp set up at the very end of the block. Dozens of skaters amazed onlookers with all sorts of maneuvers… The kickflip being my personal favorite (not to mention the only one I can name.) Sheer awesomeness. The event was, as always, free to the public and accessible by means of a free parking garage on Alston Avenue. Open Streets is produced by Near Southside, Inc. It is a non-profit community revitalization advocate organization. This organization represents a unique section of Fort Worth- one that is both historic and trendy. It was a beautiful day! Hope to see you there next year! Stacy Ellen is a writer and contributor to DFW Pet Sitting blog. She also owns Quantum Health of Fort Worth, a business offering biofeedback stress reduction technology.